The Shin Bet (Israel's Security Agency) revealed Monday that the main figure behind the elaborate terror plot is Abdallah Arar, a terrorist who was involved in the kidnapping and murder of Sasson Nureil in 2005. Arar was captured by Israel and was subsequently released in the 2011 prisoner exchange with Hamas, during which Israel released some 1,000 Palestinian terrorists in exchange for IDF soldier Gilad Shalit. Arar has since returned to terrorism. Arar is suspected of ordering Ala Salim, a resident of Jabba in the Binyamin region, to establish a terror cell and acquire an M16 assault rifle for the purpose of carrying out terror attacks. Arar gave Salim funds for this purpose. Salim turned to Rian Touam and gave him funds to acquire the weapon. Salim asked Shehadeh Touam to help him recruit members to his cell. Shehadeh recruited Mahmoud Abu Arkov, a local Hamas terrorist. 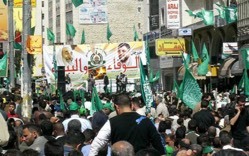 A Shin Bet official stated that Hamas in Gaza has recently displayed an intensified motivation to carry out terror attacks in Judea and Samaria. "The Security forces will continue to act with determination to thwart Hamas' attempts to carry out terror attacks in Israel," the Shin Bet stated, clarifying that Hamas in Gaza will be held responsible for any attack committed under its tutelage. The investigation is still ongoing and is being conducted in conjunction with the military prosecution. The terrorists will be indicted at a later time. The head of the Shin Bet recently warned that Israel may face a wave of Palestinian terror attacks in the coming six months, while the agency has been successful in thwarting some 400 attacks in the past year. Addressing the Knesset's Foreign Affairs and Defense Committee last month, Shin Bet chief Nadav Argaman said that the relative quiet Israel is currently experiencing is misleading, as the Hamas terror group is exerting great efforts in an attempt to destabilize the Palestinian Authority (PA) and execute terror attacks against Israelis. Argaman stressed that "the Palestinian arena has been very unstable over the past year, not only in the [Gaza] Strip and in Judea and Samaria," and was impacted by "[President Donald] Trump's announcement that he intends to move the U.S. Embassy to Jerusalem."